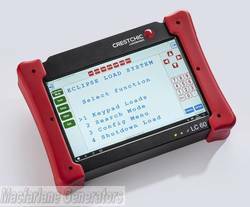 The Crestchic LC60 is a robust tablet computer designed for indoor or outdoor use in harsh industrial environments. It combines a large, daylight-readable touchscreen display with the customary storage capabilities found on a conventional PC, all housed within a resilient sealed casing to produce the ideal hand-portable device for loadbank control. When operating in the adverse conditions often encountered on-site, the durable LC60 is at home - reliably controlling the connected Crestchic equipment in even the most unforgiving of situations. The LC60 runs a variant of the user-friendly Microsoft Windows 10 operating system, which is enhanced to support the touchscreen capabilities of this device. Utilising the industry-standard environment makes the LC60 immediately accessible to operators' familiar with using standard desktop PC's or other Windows tablet computers. Supplied pre-loaded with the latest CrestCom 3 software, the LC60 fully replicates the functionality of the HHT100, Crestchic's previous handheld controller. This provides a path of backward-compatibility for existing customers, in keeping with Crestchic's ethos of extended service and support for its world-wide installed product-base. Whilst reproducing the physical look and feel of the HHT100 on-screen, the LC60/CrestCom 3 combination offers superior performance, with a host of additional benefits over its predecessor such as an easily readable large screen area, colour display with touchscreen operation, and improved IP ratings. Whether supplied as the basic controlled with a new loadbank, or as an upgrade or replacement for the last-generator of control terminal, the LC60 marries state-of-the-art technology with robust physical construction to produce a loadbank controller that is designed-for-purpose, and delivers an outstanding user experience.